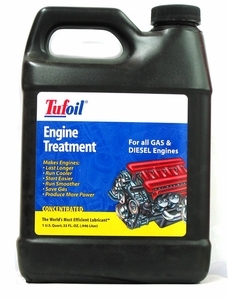 TUFOIL FOR ENGINES will keep your car or boat running so efficiently you can literally double the life of your engine. There are so many engine treatments on the market today, it's all but impossible to stand out from the crowd without resorting to dramatic infomercials or paying some high-priced spokesperson to give a convincing testimonial. You may have noticed that we don't do any of those things and yet we've earned worldwide notoriety. Several years ago, the Guinness Book of World Records chose Tufoil as "The World's Most Efficient Lubricant." To this day, we are the ONLY engine treatment in the Guinness Book. So far, no one has been able to break that record! We'll never see these prices again! But we can get the most out of what we have to pay today. Smart drivers rely on Tufoil® for help! Here's what our Tufoil customers are saying! Tufoil is "The World's Most Efficient Lubricant." Efficient-running engines use less gas! Tufoil was tested by the United States Government at their federal laboratory (The National Bureau of Standards, now known as NIST) and passed with flying colors. NIST determined that Tufoil has a surface friction so low that it makes Tufoil the most slippery substance known to man. The Federal Trade Commission has been paying close attention to many of Tufoil competitors. As a result, they have issued warnings to many of them for false advertising claims. You can check it out yourself by visiting the FTC website and typing "oil additives" in the search box provided on their website. Now it's your turn. If you like what you've read so far, check out the details on the most "Frequently Asked Questions" about Tufoil for Engines. How does Tufoil work with diesel engines? Quite well. Independent tests show that Tufoil increases the cranking speed of cold diesels by 9.6%. Naturally, easier starting means that your battery life should be greatly extended, as well! Users report startling acceleration with diesels using Tufoil. Try a bottle, You'll be glad you did. 1 Quart, 32 oz.